The Midge Warm Period | Watts Up With That? No that’s not a typo. Midges have just helped define the MWP, despite the claims of “proof” yesterday. Another recent contradictory study to involving those pesky Chironomids. In this case, more fish during warming periods seem to account for less larval midge remains. We present a chironomid-based reconstruction of late-Holocene temperature from Lake Anterne (2060 m a.s.l.) in the northern French Alps. Chironomid assemblages were studied in 49 samples along an 8 m long sediment core covering the last 1800 years. July air temperatures were inferred using an inference model based on the distribution of chironomid assemblages in 100 Swiss lakes. The transfer function has a leave-one-out cross-validated coefficient of determination (r ) of 0.88, a root mean square error of prediction (RMSEP) of 1.40°C. Despite possible biases induced by methodological aspects and the ecological complexity of the chironomid response to both climate and environmental changes, the concordance of the Lake Anterne temperature reconstruction with other Alpine records suggests that the transfer function has successfully reconstructed past summer temperature during the last two millennia. The twentieth century is the only section of the record which shows a poor agreement with other climate reconstructions and the distinct warming found in most instrumental records for this period is not apparent in the Lake Anterne record. Stocking of the lake with fish from the early twentieth century onwards was found to be a possible cause of changes in the chironomid fauna and subsequent distortion in the inferred climate signal. Evidence was found of a cold phase at Lake Anterne between AD 400 and 680, a warm episode between AD 680 and 1350, and another cold phase between AD 1350 and 1900. These events were possibly correlated to the so-called `Dark Age Cold Period’ (DACP), the `Mediaeval Warm Period’ (MWP) and the `Little Ice Age’ (LIA). The chironomid-based inference model reconstructed a July air temperature decrease of c. 0.7°C for the DACP and 1.3°C for the LIA compared with the temperature prevailing during the MWP. Key Words: Climate reconstruction • late Holocene • July air temperature • chironomids • northern French Alps. Last of all, they report that the reconstructed temperatures of the 20th century failed to show a return to MWP levels of warmth, which failure they attributed to a breakdown of the chironomid-temperature relationship over the final century of their 1800-year history. Ever more evidence continues to indicate that the Medieval Warm Period was a real and global phenomenon (see our Medieval Warm Period Project). It also continues to indicate that the MWP was likely warmer than the Current Warm Period (CWP) has been to date. Such could also be said about the new evidence provided by the study of Millet et al., although we tend to agree that there was indeed a breakdown of their chironomid-temperature relationship when it mattered most and disallowed a valid (apples-to-apples) comparison to be made between the warmth of the MWP and the CWP. However, the fact that Millet et al.’s reconstructed summer temperature dropped by about 1.3°C during the MWP to LIA transition would indeed suggest that the MWP was warmer than the CWP has yet been, since post-LIA warming is generally considered to have been somewhat less than 1.3°C … even when comparing apples to oranges! Thanks to Alan Siddons for collecting this material. Another contradictory study (recent too) involving those pesky Chironomids. In this case, more fish seem to account for less larval remains. The six scientists report that “evidence was found of a cold phase at Lake Anterne between AD 400 and 680, a warm episode between AD 680 and 1350, and another cold phase between AD 1350 and 1900,” and they say that these events were “correlated to the so-called ‘Dark Age Cold Period’ (DACP), the ‘Medieval Warm Period’ and the ‘Little Ice Age’.” In addition, they say that “many other climate reconstructions across western Europe confirm the existence of several significant climatic changes during the last 1800 years in Central Europe and more specifically the DACP, the MWP and the LIA.” Last of all, they report that the reconstructed temperatures of the 20th century failed to show a return to MWP levels of warmth, which failure they attributed to a breakdown of the chironomid-temperature relationship over the final century of their 1800-year history. October 20, 2009 in Climate_change, Paleoclimatology. I find insect frequency and range temperature reconstructions considerably more persuasive than tree rings, because insects don’t grow, hatch or breed if temperatures aren’t right. And yet again the 20th century divergence appears – reconstruction says temperatures declined, surface record says temperatures have increased. More evidence the apparent late 20th century warming is an artifact of using the average of minimum and maximum temperatures, and isn’t real. Three cheers for midges, and a few more for the folks who did the study. Here in Louisiana we love to hate a midge called a “no-see-um,” a bug named after its size and which has a pretty hefty bite. At first I hoped that some of our no-see-um’s ancestors might be the stars of this study, but alas, Google tells me they are ceratopogonids, not chironomids. Insects don’t use sunlight and CO2 as food like trees do. If sunlight, and CO2 cause warming then how can tree rings possibly be a measure of that warming instead of the sunlight and CO2 (and now cosmic rays) which *directly* effect growth in a way that temperature does not? Most tree ring proxies I hear discussed are in the arctic. Trees in the arctic? Not happy trees. Those are trees that are just barely getting by. Not many trees in Antarctica, for instance. So you would expect a temperature signal but one that is too chaotic to be meaningful due to having to rely on trees that are like patients in intensive care while tossing out the much more numerous trees walking around on the sidewalk. And warming from 1900 would only get a signal from trees that are coming out of poverty whereas cooling would have its biggest signal from trees that are for the first time ever declaring bankruptcy. But the miracle and the disasters would not be the same trees. I wish that there was verifiable evidence that the Vikings in Greenland actually grew crops (between 900 to 1300AD) and farmed in areas that are now permafrost. This is what is constantly referred to but where is the real evidence? BTW I’m a sceptic about AGW mainly because I think it’s easily explained by the planet’s recovery from the LIA, more solar radiation ( obviously not now) and phases of the PDO etc, afterall we’re only talking about an increase of 0.7 C in the last 100years. There is probably a much higher attribution due to the UHI effect and I’d dispute all this is caused by an increase in the atmosphere of 0.01% of co2, or one hundredth of 1%. Doesn’t add up. I bet that cold/warm oscillations coincide with high mortality and low birth/late birth rates in bats, who love to eat these little insects. Finally, a news article mentions the solar minimum being responsible for the current global cooling. I thought talking about the solar minimum was a taboo subject. There was a Roman Warm Period, then a cold Dark Ages when civilization retrenched, a warmer Medieval Warm Period, then a Little Ice Age and then an early 20th Century Warming to about 1944, then a cooler 1970s Record-Snowfalls-Collapsing-Roofs-Ice-Age-Is-Coming Period and then a Warming-to-the-1997-98-Super-El-Nino Period and then a Flat Contradictory-to-the-Climate-Models-Period which is still going on today. There’s your 2,000 years climate history using the fewest-number-of-dashes as possible. Ian Plimer explained it best in his book “Heaven and Earth”. Unless there is one catastrophic episode, The fauna will adapt and continue to exist. We are wasting energy and knowledge. Our best energy spent right now will be to stop any climate bill, be it U.S. or U.N.. Let mankind do what mankind does best when free to do so: Survive and excel. I expect the AGW crowd to push the solar minimum as the reason (excuse) why temperatures aren’t rising. 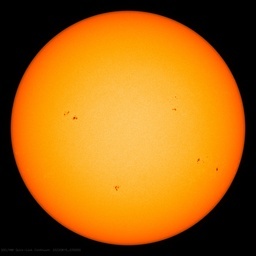 With the message that once the solar minimum ends, warming will return with a vengence. Another similarity to add to the list of similarities to ‘end of the world’ religious cults. Someone might like to notify them that the solution to this issue is to be found in the instrumental records and lack thereof. It might ease their minds and save them the trouble of trying to determine what they might have done wrong. Congratulations. We declare the AGW scare officially “midged”. The first place to look is the Viking Sagas. A notable one that’s quite hefty is the Icelandic Saga. Most have been translated to English. Other sources are books written by authors like Gwen Jones, however the real data is the source material they reference. Gwen Jones, for example uses Danish court records that talk about grain shipments from Greenland. You can’t get much more “verifiable” than the words of the people who lived at the time. But then some folks might say that those people were just denialists. Why would anyone choose to dismiss the climate periods in which the residents thereof wrote so bluntly about? It’s not like archaeology where you have to resort to C14 dating, pottery shards, tools and bone fragments to piece together what went on and how well off they were. The Romans on left clear written records which survived. Alas, there are those who wish to erase or re-write the past to satisfy their vision of how the world should be run. And, once again, hard-working researches must go out and find the physical proof to back up written accounts that nobody at the time has any reason to lie about. Don’t step on my Blue Suede Weather Shoes. Plenty of evidence about the Viking settlements in Greenland, the shells of some buildings still survive, and digs, where possible, show us their agriculture, from seed and grain samples, to domestic animal bones, remnants of wool and cloth ad so forth. It is all very well attested and accurately dated: most of the work was done in 1930’s. Historical records suggest that settlements began to decline from about 1200 A.D. as one by one the more northerly towns, if they could be called that, were abandoned: although the final collapse appears to be about 1500. The Inuits who had invaded from the other side arrived about the same time but it seems the two communities fought fiercely if sporadically and never established any trade links, although the Vikings did trade with northern Inuit settlements on the mainland. It is thought the Inuits also abandoned the country at much the same time but by comparison we have very little data about them:perhaps because they did not build in stone, grow crops or use domesticated animals. Interesting what happens in a few (geologically speaking) years. Of course, these poor animals were stranded because of CO2’s evil predecessor, CP3O. You have warm holocene, roman maximum, dark ages cold period, MWP, LIA, modern maximum. Here in Piedmont, NW Italy (at 45° N), we have a lot of historical written records, back to the Roman Age: there are records that tell us about the production and trading of olive oil during the MWP, and today this is NOT possible because the climate is still too cold. I’ve asked a forestry professional expert (20 years ago, he has got a MSc degree with Schweingruber as a tutor in dendrochronology…), and he says that we still need a 1° C increase in winter temperature to match the MWP. i think it is some sort of logical failure to conclude from a warmer past that present warming is not anthropegenic. For all that I know, the MWP could be related to an increase of the total sloar irradiance that effected mainly the northern hemisphere, and to a much less obvious extent the SH. In what sens does this discredit the role of greenhouse gases exactly? How could the MWP be anthropomorphic? You’re suggesting, in your comments, the MWP was due to an increase of solar irradiation. Did mankind control the sun at this time? Variations in the climate, much larger than the CWP, indicate there are natural cycles at work, cycles we really didn’t notice during the Dark Ages and Viking Era because of a lack of systematic record keeping and communications. At one, it was somewhat controversial to suggest there were Europeans in the New World prior to Columbus. This no longer the case. A big part of the AGW argument is the CWP (Current Warm Period) is unprecedented. By consulting several different lines of evidence, we know this is not the case. In fact, students of the history of climate were very skeptical of the hockey stick charts produced by Mann because they did not show the existence of variations in the past, such as Roman Warm Period, Dark Ages Cool Period, MWP, LIA, etc. Later the statistical flaws in Mann’s work were nailed down, confirming what students of history had already known: Mann’s hockey stick was false because it did not demonstrate what everyone (who knew what they were talking about) already knew about our climate history. It would be similar to someone coming up with an automated altitude recorder for automobiles that failed to not the change in altitude going from Denver to Grand Junction. Even the most simple minded inhabitant of Colorado would know there was something wrong with the device if it showed a flat 5,280 foot altitude from Denver to Grand Junction. No need to exam the internals of the electronics with the help of an EE. The thing is broken, fix it. If you would like a very detailed analysis of what history teaches about variations in climate, get yourself a copy of Ian Plimer’s Heaven and Earth, global warming the missing science. The Dark Ages were a terrible time to be alive. Sudden cooling took place in 535 and 536 AD and the Earth plunged into the Dark Ages until about 900 AD. It was cold, there were famine, war, change of empires and the stressed humans succumbed to the plague. Around 540 AD, trees almost stopped growing. Flooded bog oaks and timber from the time have very narrow growth rings. This was a global event because it is also recorded in tree rings from Ireland, England, Siberia, North America and South America. Snow fell in Mediterranean Europe and coastal China and there were savage storms in Scandinavia and South America. The sky was dim, there were meteor and comet swarms, flooding was common and, after the famines of the late 530s, the plague attacked Europe between 542 AD and 545 AD…. The Black Sea froze in 800, 801 and 829 AD. Ice formed on the Nile River. Such freezing has not happened since then. It was very cold. Only someone not familiar with the evidence would believe climate change is unique to the present. History tells us that already. We really didn’t need a study of non-biting midges to inform us, but it does confirm what other lines of evidence point to. Rob, the logical failure is to presume that “present warming” (in quotes because even this assumption remains conjectural) is anthropogenic. There is a preponderance of evidence favouring the role of natural events and cycles in natural cycles of global heating. Anthropogenesis is a hypothesis of a hypothesis: that the planet is in fact heating up outside of natural variability and that this heating is caused by man. See the problem developing here? Scientific evidence for AGW is extremely thin on the ground. Many of the proxy assumptions are demonstrably falsifiable (and have been, repeatedly). The role of “GHG” is just another hypothesis; again evidence remains thin that they have a dominant role (as an aside, as a biologist, I find the term “GHG” incredibly “mechanistic”, something my engineering colleagues would come up with in order pigeonhole cause and effect. We biologists much prefer continuums…:). Speaking as biologist, I am very uncomfortable with the use of complex species (ie. anything above a bacterium) as proxies for pretty much anything environmental, especially climate. Adaptability has provided a marvelous ability to most species to accommodate a very wide range of environmental conditions. Limits to how well complex species thrive are themselves complex and not homogenous. Biological systems are inherently chaotic; it stretches credibility to use them for these purposes. Certainly they may be diagnostic, but I would argue, rarely definitive. SHOCKING I tell you!!! Scientific evidence that refutes AGW claims?? It is pointless trying to argue the logic of Rob Vermeulen (02:48:47). Fact is, we don’t know what caused the RWP, DACP, MWP & LIA. Our logic says that as we don’t know and the timing for the CWP is about right, it’s highly likely that the cause is the same, even if we still don’t know that cause. Robs logic is that we still can’t definately exclude CO2. This is true but as the original logic holds water, (natural, unexplained variability), it is not for us to prove we are right, it is for Rob to prove we are wrong & this time it isn’t natural. So far, the AGW brigade have failed to disprove natural variability and have gone to extremes to try to prove there is no such variability and even if there was, this time it’s different. Yes, the burden of proof is with the AGW hypothesis. As noted on the IPCC thread, the failure to properly account for “internal forcings” that controlled past climate, (The stick part of the hockey stick) damages their case. The failure of AGW models to predict the last decades flat to dropping temperatures clearly does not help their case. Geologically speaking, it’s all about incident solar radiation. I wonder if the researchers considered the effects of pesticides in their 20th century data? (reiterating Anthony’s suggestion about the effects of DDT in another post regarding Baffin Island diatoms) I would think that pesticide use and residues would have as important an effect as fish? But perhaps the authors already corrected for the effects of man-made chemicals. Does anyone know if this is the case? There is adequate historical evidence that it was warmer in Greenland. Evidence such as records of beef exports, changes in shipping routes due to changes in the patterns of sea ice. You don’t really have to go to the Sagas. Stay away from Wikipedia when researching this. Use the library. There are some great, pre – political correctness histories from the 19th century that are great resources and had access to the written records of the time. This will require you to read from dead trees. There is also data from the GRIP ice core. Incidentally, the warmers have given up arguing that there was no MWP in Greenland. They are now saying that it was a local phenomenon. So the goalpost has already been moved. That is why this is so important, it shows a wider scope for the MWP than is conceded by the political officers in the IPCC science crew. Some on this thread have pointed out that the existence of the MWP does not disprove AGW. They are both right and wrong. There is nobody in the scientific mainstream of the skeptical community who argues that there is no AGW. The argument is about the scope of it. Warmers have been arguing that the climate has been stable for thousands of years, like Camelot in the ’60s musical. so the current warming episode must be caused by Man. I call them “flat climaters”, Skeptics argue that the current warming is within the range of natural variability, that the effect of CO2 is small enough to be lost in the noise of natural variability, they call us “flat earthers”. The existence of the MWP is huge in this regard, as is the LIA, which they desperately try to explain away with vulcanism, which no doubt played a role., but which skeptics think they exaggerate to fit their theory. Anyone care to comment on how objective and up-to-date this list of studies are at NCDC? We may not be able to definitively know what caused the Roman warm period or the Medieval warm period, but we can certainly conclude that these warm periods were NOT catastrophic. Quite the opposite… the biosphere and Mankind thrived. Those who build on flood plains, given sufficient time, will always get their feet wet and suffer loss. Nothing can change this. There are many fine statements above with which concur, that the “unprecidented” nature of the CWP is at odds with the fields of history and archaeology at least. As an amateur paleo-anthropologist over the past nearly fifty years, I have a historical climate model from what I have read. The whole climatic scenerio as proposed by Gore et al, disagrees with decades of research, actual observation records and amusingly now we get more and more reports of what seem to be perfectly good proxies in the past mysteriously losing their concordance with modern ‘observations’. Contrasting this with Anthony’s work of the surface stations, one who would concede there was indeed some warming these days but find it hard to parse how much is due to what particular forcing, might have to think there is perhaps little to no actual warming. One may have to concede the anthopogenic farce of effect on climate is ‘worse than we thought’. But there are other variables. Since the early 70’s, i have kept a sailboat in the water at a midwestern fresh water yacht club. Our enemy is the chironomid Mayfly. As the water warms, they hatch their eggs and when I go to the boat on a Saturday, they cover everything. They are thick on many surfaces and some are dead. We hose them off and they are back in a few days. In a week or two, we have spiders and webs all over the sailcovers, rigging and cockpits. They flurish and to some extent hamper mayfly reproduction. How do we know it is about water temps or birds and spider population? I also know if we have a gully washer t-storm, there is an increase of cooler water on the bottom and less hatching. 1408 A wedding is held at Hvalsey Church. This is the last written record of Greenland’s Norse population. Henry Chance (07:55:03) – Chironomids and mayflies are different critters . Adult chironomids somewhat resemble mosquitos , but don’t bite ( as far as I know ). I have read articles (most likely from Scientific American) that say that the Vikings on Greenland essentially existed by transplanting (pun intended) ordinary agricultural and farming procedures from europe to the new lands. The Inuit on the other hand, coming from a culture that existed mostly by hunting in the Arctic, continued to live on Greenland by hunting seals whales and the like, and never adopted any of the European agriculture practices of the Vikings. As a result, when the rot set in, and the MWP gave way to the LIA, the Vikings were forced to abandon their settlements; but the Inuit; having never adopted the agriculture were able to continue on by their normal hunting for arctic animals. Sorry I can’t give any reference; my mind is already full just remebering the stories, and I have no corner left to load in library cards. We allready know that the MWP was occuring in Europe. Why does this study about France help in showing it is a global phenomenon. Don’t know about France; but a well known study of many other studies, that was done by Dr “Willie” Wei Hok Soon, and Dr Sallie Baliunas, seemed to indicate quite clearly that both MWP and LIA were in fact global phenomena. Michael Mann’s Hockey stick however was in his own words, just a local phenomenon; sicne it says “Northern Hemisphere” right on the published graph. For those who love chironomids and would like some further reading, here are some links to studies done in southern British Columbia. Yes, I know it might just be a local phenomenon, but it was warmer here in the past and for the last several thousand years the climate has cooled. Who would have thought? A reference to the GUS site. Doesn’t go into the farm itself much, but it’s a starting point.